For many, the idea of searching for colleges is daunting. After all, there are over 7,000 colleges and trade schools to choose from, so it’s easy to become overwhelmed by choice. 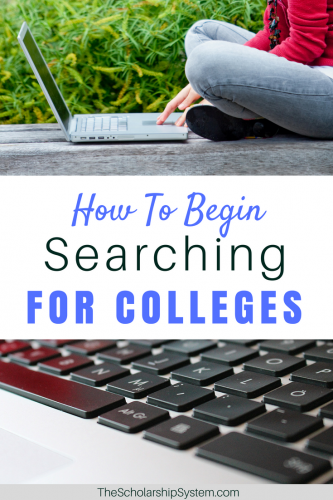 Luckily, searching for colleges doesn’t have to be hard. In fact, if your child takes advantage of certain resources and keeps an open mind, they might find their ideal school faster than you think. If your student is preparing to dive into their college search, here are some steps for them to follow. While many students believe the best way to start searching for colleges is to jump right in, performing a self-assessment can be a valuable part of the process. Before your child begins with their research, have them really consider what they want from a school. For example, do they learn best if the class is large or small? What resources and amenities do they need for their studies? What about their preferred form of stress relief? Do they need a specific living situation? Ultimately, looking beyond their major can help them identify schools that offer not just a quality educational experience, but the right environment and cultural match, which can be equally important. Your child’s guidance counselor can be an excellent resource when searching for colleges. They often know about your student’s performance in high school, have access to relevant test scores, and are also well-versed in what’s available at different schools, particularly institutions nearby. Plus, the guidance counselor can help your child identify additional criteria they need to consider when searching for colleges. These professionals may know whether your student could qualify for specific forms of institutional financial aid, like scholarships or grants. Their guidance counselor might not have all of the answers, but they can definitely help your child get their footing and identify areas of focus before they begin searching for colleges. Another important step before your child begins their research is to make sure that they (and you!) will remain open-minded. For example, just because you’ve never heard of a particular school before doesn’t mean it isn’t worthy of consideration. With so many colleges in the country, no one has been exposed to all of them. If a school appears to have potential, encourage your child to add it to the list of institutions worth exploring. Similarly, both private and public schools can be great options. Many people assume that all private schools are more expensive than public ones, but that isn’t always the case, especially if your student may qualify for an institutional scholarship or even a free-ride. It’s also wise to leave out-of-state schools on the table when searching for colleges. Just because a school is in-state doesn’t guarantee it will be cheaper, so don’t limit your child’s research based on an assumption. The internet provides access to a vast array of resources when it comes to searching for colleges. Your child can perform simple searches to find schools in a specific town, state, or country, if they have a target location in mind. Alternatively, they can explore many of the large school comparison websites available, allowing them to take a broader approach when searching for colleges. Many of the larger search sites allow students to provide certain criteria to help them narrow down their options. This can include location, majors, cost, and more! For example, Big Future by the College Board has a nice selection of search options. Plus, they provide a really solid overview of each school, letting your child find basic information about everything from the size of the campus to unique facilities on campus to application deadlines. Some sites also provide your child with access to student reviews. These can give them an inside look at what real students think about the school, providing them with additional insight into what their experience may be like. However, it’s important that your student relies on reputable resources. Some websites push specific schools for monetary reasons, inflating their positions on results lists or giving them preferred features (like allowing them to include more photos or other forms of information). Others may use fake reviews. There are also websites that charge students to access their database and could even be scams. If your child is searching for colleges through a site like Big Future, it’s vital that their research doesn’t end there. While many of these provide great overviews, your student still needs to dig deeper, such as by following the steps below. As your student identifies potential schools while searching for colleges, it’s smart to head over to the institution’s website to gather more information. Most colleges have sections of their sites dedicated to essential topics, like financial aid, admissions requirements, student life, available programs, typical costs, and even graduation and job placement rates. Details about their accreditation should also be accessible (and, if not, that should be considered a red flag). If your student wants more information, they may be able to request information packets from the college. These may provide more detail than is on the website, so they are worth asking for if your child is particularly interested in a particular school. Sometimes, the best way to assess a school is with a campus tour. Most colleges and universities offer these options on a set schedule, giving prospective students a chance to see what it may be like if they decide to attend classes there. Typically, they’ll get to view the campus, dorm rooms, common spaces like student centers and cafeterias, and much, much more. Plus, your child can ask the tour guide (and potentially other school employees) questions that are relevant to them. This can be incredibly important when your student is searching for colleges and needs to narrow down their list. It’s also common to be able to speak with someone in admissions or financial aid, giving your student valuable information about the school’s processes, costs, and requirements. As your child gathers information, it’s important that they narrow down their list. In the end, they want to determine which colleges provide enough of what they are looking for to make the cost of applying worthwhile. However, remind your student to keep a few options on the table. Putting all of their proverbial eggs in one basket isn’t always the wisest move, even if their preferred school has a high acceptance rate. With a bit of time and dedication (and a little bit of travel), your child can find the right college for them. And, by doing so, they are more likely to have a positive educational and social experience, allowing them to create memories that will last a lifetime. The post How to Begin Searching for Colleges appeared first on The Scholarship System. Ondo as a cattle colony?